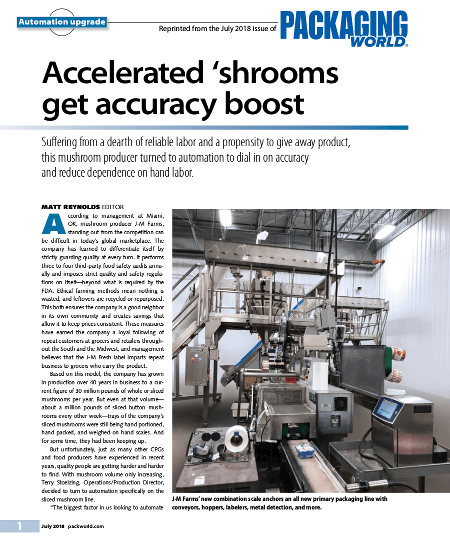 Suffering from a dearth of reliable labor and a propensity to give away product,this mushroom producer turned to automation to dial in on accuracy and reduce dependence on hand labor.According to management at Miami,OK, mushroom producer J-M Farms,standing out from the competition can be difficult in today’s global marketplace. The company has learned to differentiate itself by strictly guarding quality at every turn. It performs three to four third-party food safety audits annually and imposes strict quality and safety regulations on itself—beyond what is required by the FDA. Ethical farming methods mean nothing is wasted, and leftovers are recycled or repurposed. This both ensures the company is a good neighbor in its own community and creates savings that allow it to keep prices consistent. These measures have earned the company a loyal following of repeat customers at grocers and retailers throughout the South and the Midwest, and management believes that the J-M Fresh label imparts repeat business to grocers who carry the product.